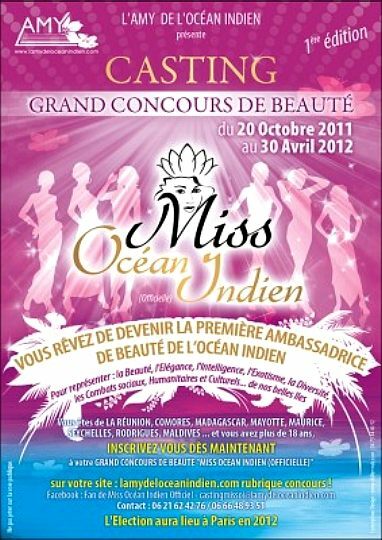 On Friday, June 3, 2011, at Saint Denis Wilson Salon, the first edition of the competition for Miss Indian Ocean 2011 was held. The event was presented by Omar Evenementiel. The organizers of this event were aiming to highlight: "the exotic beauty of the islands of women and cultural secrets they contain." They claimed that: you will discover the vintage that hides the islands of Reunion, Comoros, Mayotte, Mauritius, Seychelles, Maldives and the island of Rodrigues and obviously MADAGASCAR, which will be represented by EMILIE and NATASHA respectively MISS FIRST MALAGASY 2010 DAUPHINE 2010, the Election MISS MALAGASY, elected in Nanterre. This event was presented by the charming Medina Kone, in front of the ambassador of the election Diyenaba Bakiri and sponsor gentlemen: Claudy Siar and François Durpaire. Jacky Brown (Brown Neg) Emy (Reunion artist) and Neeko (ex member of the Ways II) was also present. The evening was said to be unforgettable, with DJ's and VJ's of the moment: Saidou DJ, VJ Faith, DJ Maestro Madagascar, WAN and guest DJ, DJ Jano. Saint-Denis is a commune in the northern suburbs of Paris, France. 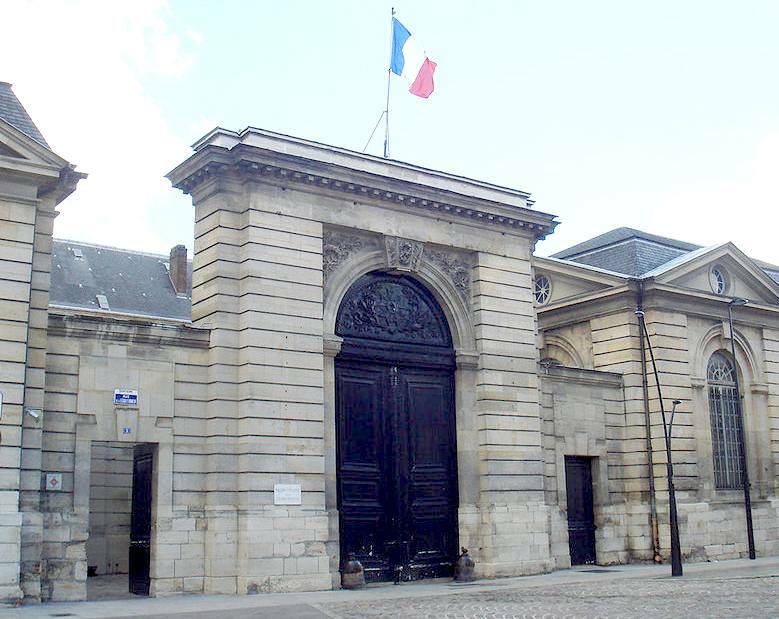 It is located 9.4 km (5.8 mi) from the centre of Paris. Saint-Denis is a subprefecture (French: sous-préfecture) of the department of Seine-Saint-Denis, being the seat of the arrondissement of Saint-Denis. Saint-Denis is home to the royal necropolis of the Basilica of Saint Denis and was also the location of the associated abbey. It is also home to France's national football and rugby stadium, the Stade de France, built for the 1998 FIFA World Cup. 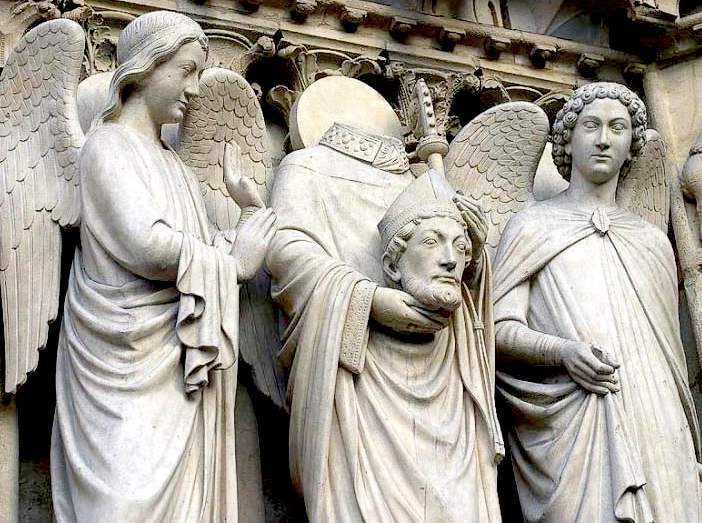 Saint Denis (also called Dionysius, Dennis, or Denys) is a Christian martyr and saint. 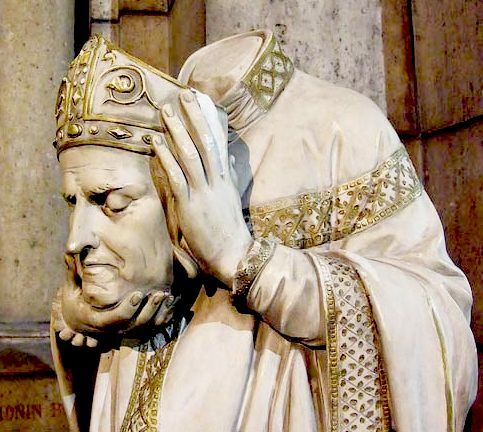 In the third century, he was Bishop of Paris. He was martyred in connection with the Decian persecution of Christians, shortly after A.D. 250. After his head was chopped off, Denis is said to have picked it up and walked ten kilometres (six miles), preaching a sermon the entire way, making him one of many cephalophores in hagiology. He is venerated in the Roman Catholic Church as patron saint of Paris. The Indian Ocean Commission (IOC) is an intergovernmental organization that was created in 1982 at Port Louis, Mauritius and institutionalized in 1984 by the Victoria Agreement in Seychelles. The IOC is composed of five African Indian Ocean nations: Comoros, Réunion (a department of France), Madagascar, Mauritius and Seychelles. Notwithstanding their different characteristics (Reunion as a French department; Mauritius and Seychelles as Middle-Income Countries whereas Comoros and Madagascar are amongst the Least-Developed Countries), the five islands share geographic proximity, historical and demographic relationships, natural resources and common development issues. MISS INDIA - has been participating in the Miss Universe pageant since 1952, starting with Indrani Rehman and in the Miss World pageant since 1959, starting with Fleur Ezekiel. 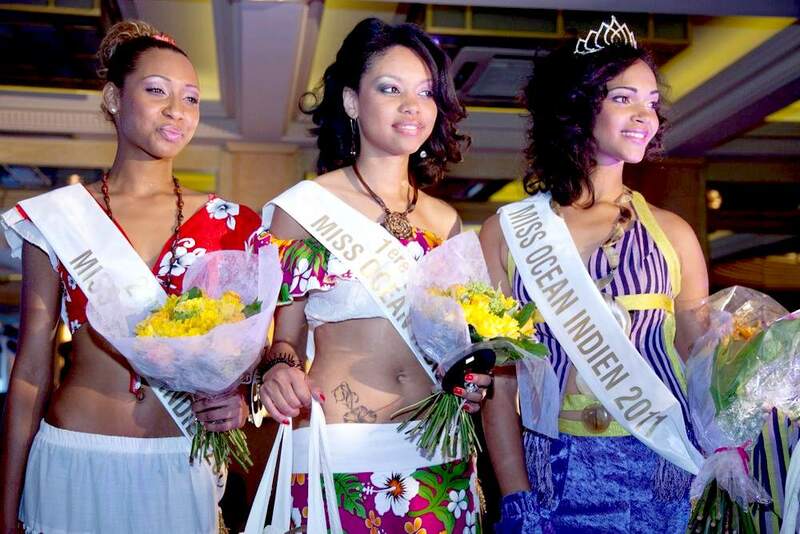 Historically, the Femina Miss India pageant sent the winner of the pageant to the Miss Universe pageant and a runner up to Miss Asia Pacific pageant and on some occasions the 2nd runner up used to represent India at International Teen Princess contest, whereas Eve's Weekly, a rival women's publication sent the winner of its Miss India contest to Miss World and Miss International. In the 1970s, Femina acquired the rights to send a representative to Miss World as well, and started to send the winner to Miss Universe and the runner-up to the Miss World contest. Later in 1991, Femina Miss India also acquired the rights to send India's representatives to Miss International pageant. In 1994, following India's historic dual wins at both Miss Universe and Miss World, the custom of crowning a single winner was discontinued. Instead, the top three placers were designated a winners with equal visibility, equal prizes and responsibilities, and were crowned as Femina Miss India-Universe, Femina Miss India-World, and Femina Miss India-International or on some occasions the third winner represented India at Miss Asia Pacific and was crowned as Femina Miss India-Asia Pacific and a finalist was sent to Miss International. In 2002, the third title was changed to Femina Miss India-Earth, to designate India's representation at the newly launched Miss Earth pageant, focused on the cause of environmental advocacy and a finalist was sent to Miss International. From 2007 to 2009, three equal winners were selected going to Miss Universe, Miss World, and Miss Earth. In 2010, Femina Miss India decided to stop sending representatives to the Miss Universe pageant entirely, choosing instead to send a crowned winner to Miss International. Miss India or Femina Miss India is a national beauty pageant in India that annually selects representatives to compete in Miss World and other international pageants. It is organised by Femina, a women's magazine published by Bennett, Coleman & Co. Ltd (also known as The Times Group). The reigning Femina Miss India winners are Aditi Arya, Aafreen Vaz and Vartika Singh. Many such contests are now used to highlight ocean pollution issues. This webpage is copyright © Cleaner Oceans Foundation Ltd (Company No: 4674774) July 2015, Solar Studios, BN271RF. The name Miss Ocean™ is a trade mark of the Cleaner Oceans Club™. The blue bird in flight logo is a trademark of BMS Ltd, used under Licence.